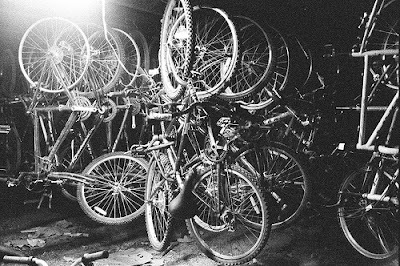 This First Friday, I'm participating in the 5th annual Bike Part Art Show to benefit Neighborhood Bike Works, an organization that I volunteer with. On October 5th, starting at 5PM, at the Power Plant Gallery (which is located on New Street, between Race and Vine), there will be live music by local musicians along with an art show and auction. Every year, Neighborhood Bike Works opens their shop to local artists to come in and make works of art from recycled bike parts. This is the culmination of the artists' works. 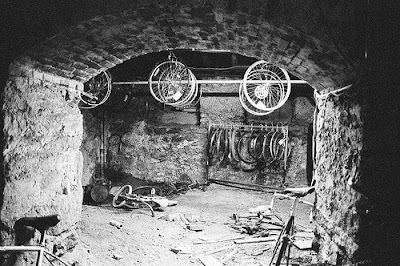 I will be showing two photographs that I took of the basement of the shop about a year ago. In addition, on Saturday the 6th from 11am-6pm, there will be an open gallery and bicycle repair workshops featuring graduates from NBW programs and technicians from Bicycle Therapy. And on Suday the 7th from 11am-6m, there also be an open gallery and social action forum. For more information on that, visit www.beaspokesperson.org.